Sunderland boss Jack Ross has revealed the thought process behind handing an opportunity to youngster Benji Kimpioka. The Swedish teenager was introduced late in the second half during the friendly at Hartlepool and put in an impressive cameo performance. 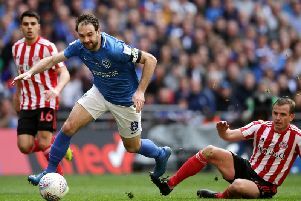 His skill and trickery certainly seemed to please the travelling Sunderland fans, and the winger had them up on their feet deep into injury time as he rifled home a late leveller. Kimpioka is one of several youngsters to be given a chance by Ross during pre-season as the Scot offers some of his promising talent an opportunity to impress. And the Sunderland boss has revealed why he handed the pacy winger a chance at Victoria Park. With the Black Cats still searching for a number of new faces, Ross finds his squad somewhat thin on the ground. That has opened the door for young players to grasp their opportunity – something Kimpioka has undoubtedly done with back-to-back hat-tricks in the under-23 squad’s first two pre-season games. The second of those hat-tricks was witnessed by Ross, who decided to hand the winger a place in his first team squad for this friendly. “It’s an opportunity for young players and some of them take it because of time,” he admitted. “Benji, I was at his game during the week and he scored a hat-trick which was an opportune time for him. While there will undoubtedly be plenty of excitement around Kimpioka, Ross is keen to keep his feet on the ground and focus him on the hard work ahead. That isn’t to say he can’t he enjoy the moment, though. Ross added: “I told him to enjoy it, because it is something he should enjoy, his first senior goal and being on the pitch with first-team players.